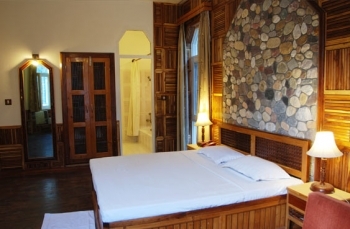 Wild Crest Resort is luxury property situated amidst wilderness of Corbett National Park. The resort offers myriad of activities where you cab explore the wildlife in the jungle, enjoy swimming, indoor or outdoor games and even have a lively musical evening with you friends and family. 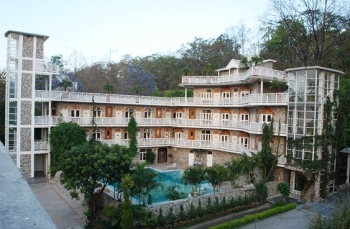 The resort is located in the Laduachaur village near Dhikuli in Corbett. The famous local temple Garjiya Devi Temple is located close to the resort and can be easily visited. 33 Swimming Pool block has pool facing Golden Palms rooms, each room is air conditioned and equipped with satellite television, Every room has lovely view of swimming pool & green lawns, each room has luxury modern bathroom attached. The resort has a multi-cusine open space restaurant comprising garden fresh farm house creations where you can feast on delectable dishes in open air & enjoy bar-be-que offered in the evening (winters only). The resort also features one snacks counter near the lawn acompannying glistening blue swimming pool. - 35 - 40 pax in u shape formation, Conference hall is equipped with audio visual aids like LCD projector, arranged meeting of 50 to 750 persons in open lawns. - Table tennis, softball cricket, badminton, volleyball, kids play room, indoor games, Dj with dance floor. - Rappelling, river crossing, cycling, night safari, bird watching, kite flying, kumaun village visit can be arranged on request. - Above rates are inclusive of breakfast, lunch and dinner. - Group and Conference rates are available on request. The resort is 270 kms from national capital New Delhi and can be reached by taking highway NH-24. The nearest domestic airport is Pantnagar which is 90 kms away from the resort. Nearest railway station is Ramnagar 7 kms and an easy way for tourist to reach the resort.